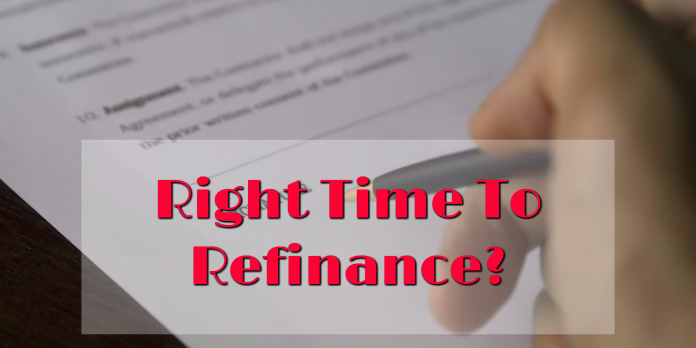 Right Time To Refinance: What Is A Refinance? The first thing that you need to know before evaluating if this is the Right Time To Refinance you first need to be educated on what a refinance is of your current mortgage. Let’s say you have bought a home and have been living in it for a while and you feel you are able to get a better mortgage rate than you currently have or you’d like to access some of your equity in order to do some renovations around the house or finish a basement, there are a lot of different options for you. There are many different types of refinances out there so knowing which route you need to go is vital to your decision making. Let’s take a look at the questions or decisions you need to be making to make sure you are looking at the loan product that best fits what you are trying to do. If you bought a home 4-5 years ago before mortgage rates really sank to historic lows, or if you have an existing conventional loan mortgage that was obtained with less than perfect credit and down payment, a new loan might just be what you need. As long as there is a tangible benefit with the refinance it should be approved. What most lenders do not want you to do is to refinance into a higher mortgage rate in an attempt just to not pay on their mortgage for 45-60 days as the go through their refinance. You can take on a higher payment if you refinance into a loan with a shorter term resulting in a higher payment. If you can reduce your rate by at least 0.25%, there is no reason why you shouldn’t refinance. The lower your mortgage rate goes, the better off you will be! If you are one of the borrowers who decided to take out an ARM and your term is coming up for the mortgage rate to adjust, you need to act now and it is probably the Right Time To Refinance. More likely than not the current rate of your mortgage is going to go up significantly from when you got your loan roughly 5 years ago. When rates were at historic lows the mortgage rates on ARMs were that much lower and could potentially be 3-4% more now once they adjust depending on the Index and Margin associated with the loan. Now there are 2 potential options for you when you are refinancing an ARM and it can be to take out another ARM or lock into a 30-year fixed rate mortgage. If your plan is to stay in the home for the long term, than a fixed-rate mortgage may be the option for you. There is another option and if you don’t plan on being in the home for another 5 or so years then refinancing into another 5/1 or 5/5 ARM is going to be a benefit for you as the rate will be less than the current 30-year fixed rates. You are going to need to make sure that you are fully informed and definiteive on your decision or you might find yourself needing to refinance again shortly down the road. If you can afford a higher monthly payment on your mortgage and you ideally want to get your mortgage paid off sooner, then it might be the Right Time To Refinance into a 15-year fixed rate mortgage from your current 30-year fixed or ARM product. Let’s say you are currently on a $250,000 mortgage with a 30-year fixed loan at 4.25%. This monthly payment for principal and interest would be $1,230, now if you changed into a 15-year mortgage at 4% you are looking at a payment of $1,849. Over the course of the loan the 30-year would have $442,800 in payments with the 15-year at $332,820 saving just about $110,000 and getting your loan paid off in 15 years less than you imagined. As you can see, if you have the finances to pay over a shorter term, you can rest assure knowing that you will save thousands of dollars in interest over the course of the loan. If you have a renovation you are looking to get done and you have adequate equity in your home then it may be the Right Time To Refinance by way of a Cash-Out Refinance. With this type of refinance you are going to get taking money out against the equity built up in your home. Depending on the loan program you can borrow up to the value of your home with 100% LTV or you could be capped at 90-95%, it all depends on the loan you choose and here at Loan Consultants we can give you the information to make all this possible for you and try to develop a plan to get you the most cash at the most reasonable price. If you have been putting off finishing your basement, remodeling your kitchen, or adding an addition, this is a way for you to get the cash needed to complete this work. You also have to keep in mind that it will add to your loan’s term so even though it might be the Right Time To Refinance you will be paying for access of this cash as long as your house loan term. Right Time To Refinance: Is The Time Right? Refinancing can be very beneficial for borrowers and knowing if it is the Right Time To Refinance is vital in ensuring that you take on a mortgage you are comfortable with and can afford for the duration of the loan. The worst thing you can do is take on a loan that will put financial strain on your budget. While working with Loan Consultants we want to make sure the loan program you choose is truly the best one for you and will give the most benefits for you. Sometimes it may not be the best option to refinance your loan but unless we evaluate what your goals are, we will never know that. There will be no pressure in doing a loan for you just because, we want to ensure it is truly the best scenario for you! If you’d like to hear more, please reach out to me ASAP at 888-900-1020, I look forward to hearing from you!